It's 50 years since Panorama pulled off the most celebrated April Fool's spoof and duped Britain - and beyond - about spaghetti crops in Switzerland. So what makes a great April Fool's joke? 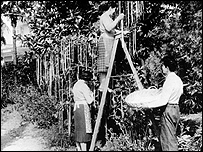 Panorama's now infamous spaghetti-tree spoof is considered a broadcasting milestone as it is believed to be the first time television was used to stage an April Fool's hoax. Made on a budget of just £100, it told the tale of spaghetti harvesting in Switzerland and described how the seemingly bumper crop was at risk of late frosts, creating a disastrous situation for growers all over Europe. The spoof documentary showed people in the Swiss Alps plucking strands of spaghetti from trees and laying it in the sun to dry. That it fooled so many was in part down to the fact that pasta, at the time, was deeply exotic in a nation reared on meat and two veg. Then there was the commentary provided in serious, hushed tones by that giant of broadcasting, Richard Dimbleby. 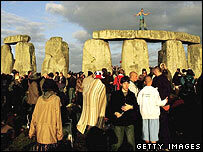 The hoax repeatedly tops lists of April Fool's gags, which typically include the one about moving Stonehenge to the base of Mount Fuji in Japan, plans to make the whole M25 run clockwise and anti-clockwise on alternate days, the internet being shut down for cleaning for 24 hours, whistling carrots, left-handed hamburgers and Big Ben going digital. Part of the charm of April Fool's is that it's an equal-opportunity day, say fans. From whoopee cushions to TV pranks broadcast across the world, almost everybody has the chance to join in. It is a global phenomenon, with most cultures having a version of it. But only a few gags achieve the longevity of the Panorama stunt, which is still talked and written about across the world 50 years on. So what makes a great April Fool's joke? A really good gag needs to be both ridiculous and believable, say those who have studied the craft. It's a hard trick to pull off and most pranksters end up with jokes that are ridiculous, but not at all believable, says Alex Boese, curator of the Museum of Hoaxes in San Diego, California. Do they know it's moving to Japan? "The really good ones succeed at making us believe something that we recognise, in hindsight, we really shouldn't have believed because it's completely preposterous," he says. "In a humorous way they teach us something about the limits of our own knowledge. 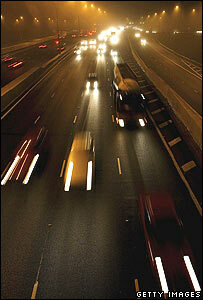 They show us how unfamiliar many of the things around us - that we take for granted - are." The question has employed some of the world's finest brains. The eminent wartime scientist Reginald Jones, who headed the Directorate of Scientific Intelligence at the Air Ministry during World War II, researched the perfect April Fool's gag. He came up with the equation: induction followed by incongruity. "Basically he was saying lull them into a false sense of security, then drop in absurdities that just keep getting more and more extreme," says Martin Wainwright, author of the newly published Guardian Book of April Fool's Day. Both Boese and Wainwright rank the Panorama prank as the best ever. It pulled off the trick of not only fooling the easily persuaded, but also left the sceptics with a nagging doubt about whether it was true or not. One of the things that makes it so great is that it was executed by a programme synonymous with sober and serious reporting. Getting the authoritative figure of Dimbleby to do the commentary was also a master move. "Television was limited in those days to one BBC and one ITV channel and it was possible for a programme like Panorama to hold the nation's attention in a way inconceivable nowadays," says Wainwright. "Small details like the ageing wicker harvest baskets added to the realistic air. In his engaging and entirely trustworthy style, Dimbleby told the audience 'we end Panorama tonight with a special report from the Swiss Alps'. Cue the marvellous film, brilliant commentary and the swelling music." There was always the risk that it might offend, and some people did complain to the BBC, but most loved it. Tony Frost e-mailed the BBC's On This Day website with his memories of the hoax - he was eight at the time. "It wasn't until many years later, when I was in my late teens, that I realised this was perhaps not the case [that spaghetti grew on trees]. Even now, as an adult, I'm hopeful of spotting one or two trees as I drive around the country and the Continent. It's one of the great April Fool's jokes and one I'll always cherish." An indication of its quality is that every time it's shown, people still fall for it, says Wainwright. But there is a serious side to pulling off a successful prank. A gag should do no harm and should not place anyone in a dangerous situation, say the experts. Disregarding these rules can have serious consequences. A town clerk in Canada had a heart attack after his colleagues played an April Fool's joke on him. They sent an e-mail saying the deadline for a big project he was working on had been moved forward a week. He survived, but the council passed a resolution banning April Fool's jokes. This also applies to the emotional, as well as the physical, fallout. There is a fine line between catching someone out and humiliating them or hurting their feelings. "In Romania, during the Ceausescu era, one newspaper printed an article as an April Fool's joke saying all political prisoners were being freed," says Wainwright. "People started turning up at prisons and waiting for family and friends to be released. It didn't go down well when it was revealed to be a hoax." Saddam Hussein's feared son Uday was also reportedly a big fan of the day and would pull pranks like telling people food rations were being lifted. Side-splitting stuff. The internet has given the day a whole new lease of life, says Wainwright. Gags include advertisements for free coffee cup holders asking users to click their mouse on an on-screen button. This - somehow - makes their disk drive open, hence the free coffee cup holder. Wikipedia, the online encyclopaedia anyone can edit, is particularly exposed. Last year someone swapped the "protect" and "delete" buttons on every page, so that anyone trying to stop an article from being edited ended up deleting it. But ultimately people either love it or loath April Fool's Day. For all the haters there is one consolation this year, it's not a work day so no mugs glued to desks and no phones covered with sticky tape - hopefully. My granny was entirely convinced by the "spagetti grows on trees" story. Only a great deal of explaining would change her mind and even then she wasn't quite sure about it all. When she visited us in Kenya and saw field of pineapples for the first time she point blank refused to believe that we weren't trying to fool her again. I loved the series of newspaper ads run by BMW in the 90s. Favourite was a car which could switch to left-hand drive quickly by using a steering wheel folded into the glovebox and fold-down pedals! I remember the hoax on Westward TV, many years ago now. Time was to go decimal! 10 hour days! I have the dubious achievement of having been born on April Fool's Day. I have had many fantastic, personalised tricks played on me. The best was a styrofoam cake perfectly coated with icing but impossible to cut! (There was a real cake as well - my parents are not that cruel.) Plus no one ever forgets my birthday! The best one was in 1975 when Noel Edmunds did his morning radio show on a plane flying from Heathrow to Aberdeen when he asked people to wave at the plane as it flew north. Many people did. I know people who went out to Aberdeen airport to meet him!!! I only twigged it was an April fool when he played I Mandy Fly Me by 10cc. I remember an article in the Grocer magazine sometime in the 1980s, about flavoured eggs, especially bacon flavour.